Dacia Duster 2012: pre-order for 100 | What Car? 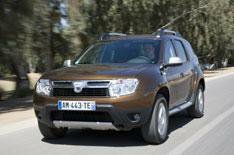 The Dacia Duster will be available to pre-order from June 28, for a deposit of 100. The Duster is a budget-priced rival for compact SUVs such as the Hyundai ix35 and Nissan Qashqai. Dacia which is owned by Renault has announced that prices will start from less than 10,000 for front-wheel-drive models and that four-wheel-drive versions will be available from less than 12,500. Customers can pre-order a Duster from June 28, for a 100 deposit. Dacia says pre-ordering will ensure customers are given priority delivery of their Duster, with first deliveries planned for January 2013. Prices will be guaranteed during the pre-ordering period until December 2012. Full specification and prices will be revealed closer to the Dusters on-sale date in June.